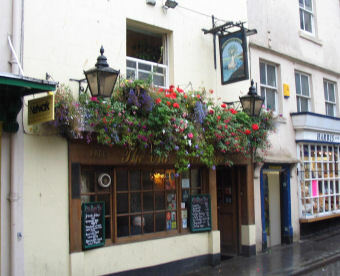 A classic Bath pub. This is always my first port of call on any crawl around the city - mainly because we've just spent the previous few hours traipsing around the shops. Great selection of beer, with the Palmers Tally Ho in very fine form when I called in last week. A very nice welcome too, so not sure if people have caught the bar people on bad days. Quiet and cosy little place with wood panelling and fireplace in thirties style. Liked the mild and Goldrush bitter. Would go again, but you'd probably get a warmer welcome from the guy on the stool at the bar than from the barstaff. 2 room pub with only a bar on 1 side which I loved. Again a good mix of locals and rugby fans made this place a fun place for a pint. 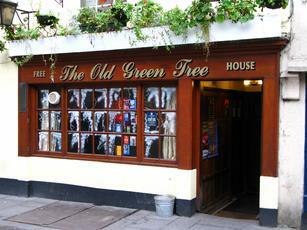 4 beers on tap, I had the Old Green Tree Ale @ 3.9% brewed for the pub by Blindmans Brewery. Met a very interesting chap sat at the bar that 2 of us instantly decided he could be a mass murderer, he was a pleasant chap but one or 2 of he's stories were a bit iffy...made for a cracking laugh though. A point of note are the men's toilets, there's a door in the bar that opens onto a long straight staircase and at the bottom are the urinals...I wonder if anyone has ever fallen down and ended up in the urinal! Excellent pub, defiantly worth a visit.